Help Tafo Trust is a Scottish charity, a local NGO based in Banchory, Scotland, set up to build and run a school in rural Ghana. 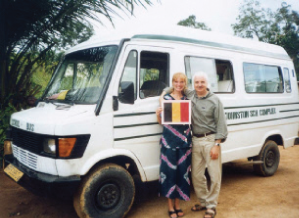 The trust was started in 2002 by Basil Johnston aka Madam Eric (right with husband Eric) who bought sufficient land to build a nursery and primary school, with enough farm land to grow crops in order to feed the children. Ghana is viewed by many as a beacon in Africa's struggle towards democracy. They held their 6th democratic presidential election in December 2012. A stable, peaceful country, Ghana is trying hard to alleviate poverty and improve things for its people. Help Tafo Trust staff receive no salary or other remuneration. We are a non-profit making, non-political and non-religious charity, operating to provide quality education in the Tafo district. 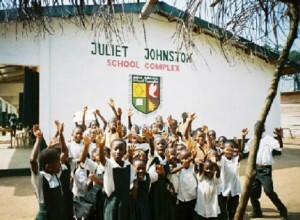 Juliet Johnston School is in Tafo, in the Eastern Region of Ghana, about 2 hours inland from Ghana's coastal capital Accra. The school opened in September 2003 with 49 children and just 5 classrooms. Now in its 15th year the school has over 300 children ranging in age from 3 to 18 years. In addition to completing our nursery and primary school buildings, we now have 15 classrooms, a library and rudimentary computer room, 3 of the classrooms housing the three junior high school (JHS) classes needed for the school to offer education to Ghanaian equivalent GCSE standard. 2010 is our first graduating year. The objective of the school is to help hardworking, bright children from the most impoverished outlying villages. Our first graduating year was in 2010 and since then our graduating exam results have been in the top 5 or 10 of the approximately 100 schools in our district. This is a big achievement since the other schools in the top 10 are much better resourced than ours, their children don't come from the rural villages and their parents are literate and employed, whereas the majority of our parents are illiterate subsistence farmers. In addition to the school's educational objectives, we provide employment for 24 teachers and support staff, and fund basic accommodation and medical help to deserving local people. We would never have achieved so much without the enormous generosity of all our supporters, relying wholly on donations to sponsor our children and keep our buses on the road. If you can help, it costs £12.50 a month to sponsor a child which includes food and transport; £45 to transport a child to school for a year and £40 a month to pay one of our teachers. But of course we welcome one-off donations of any size. 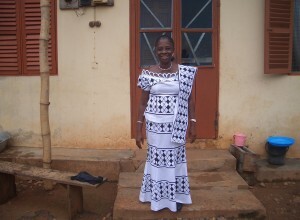 A little goes a long, long way in rural Ghana, and secondly, while the charity is small, it manages to achieve a huge amount despite limited resources. No one is paid a salary, and 100% of all money donated goes direct to Ghana to fund the school and the charity's other associated aims.